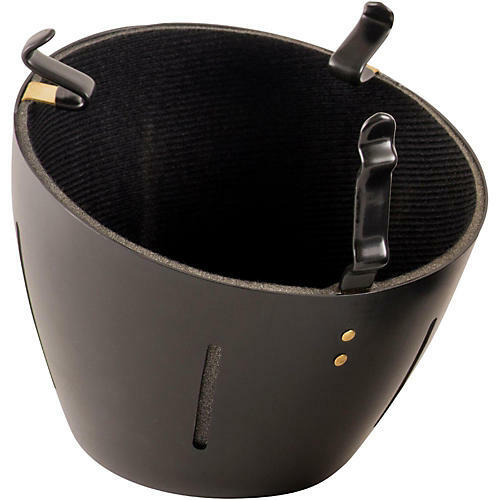 The Soulo Bucket Mute keeps your instrument perfectly in tune in all registers including pedal tones, which are notorious for their intonation difficulties when muted. It has no back pressure, no 'squirrely' notes, and the Soulo Bucket Mute is considerably lighter than any other brand of bucket mute available. Its unbreakable coated brass clips are flexible and accommodate all bell sizes, allowing for a quick on and off. The cotton bag it comes with not only protects it from wear and tear, but also provides a darker bucket mute sound when the bag is stuffed inside the mute. This allows the player to blend perfectly in a section containing different brands of bucket mutes. It works beautifully for performance and sound recordings, and will never fall off the bell.